TL;DR I gave a talk Genomics in R about querying genomic annotations and references in R/Bioconductor. In this post, we re-visit all the operations in my talk using Ensembl references instead of UCSC/NCBI ones. Some Bioconductor packages are the building blocks for genomic data analysis. I put a table here containing all the classes covered in rest of the post. If you are not familiar with these classes and their methods, go through the talk slides first, or at least follow the annotation workflow on Bioconductor. OrgDb Gene-based information for Homo sapiens; useful for mapping between gene IDs, Names, Symbols, GO and KEGG identifiers, etc. TxDb Transcriptome ranges for the known gene track of Homo sapiens, e.g., introns, exons, UTR regions. OrganismDb Collection of multiple annotations for a common organism and genome build. BSgenome Full genome sequence for Homo sapiens. AnnotationHub Provides a convenient interface to annotations from many different sources; objects are returned as fully parsed Bioconductor data objects or as the name of a file on disk. In Bioconductor, most annotations are built against NCBI and UCSC naming systems, which are also used in my talk. However, there is another naming system maintained by Ensembl, whose IDs are very recognizable with suffix “ENSG” and “ENST” for gene and transcript respectively. The gene tree tab shows its homologs and paralogs. The variant table tab shows various kinds of SNPs within MAPK1’s transcript region. SNPs are annotated with their sources, different levels of supporting evidence, and SIFT/PolyPhen prediction on protein function change. Finally, there is a external references tab which links the Ensembl IDs with NCBI CCDS and NCBI RefSeq IDs. There are many ways to explore different aspects of this gene, and it seems everything at multiple biological levels is simply connected. I always think of the Ensembl ecosystem as a decent learning portal, so it is a pity if one cannot easily use its information in R/Bioconductor. After a quick research, I found using Ensembl annotations are quite straightforward even though the required files does not ship with Bioconductor. Also, there were some topics I failed to mention in the talk, such as AnnotationHub and genomic coordinate system conversion (e.g., from hg19 to hg38). I am going to cover these topics in the talk. The same OrgDb object for human (org.Hs.eg.db) can be used. It relates different gene IDs, including Entrez and Ensembl gene ID. From its metadata, human’s OrgDb gets updated frequently. Most of its data source were fetched during this March. So one should be able to use it for both hg19 and hg38 human reference. We got no Ensembl transcript ID for MAPK1, which is impossible. Therefore, to find the real Ensembl transcript IDs, we need to find other references. There is no pre-built Ensembl TxDb object available on Bioconductor. But with the help of ensembldb, we can easily build the TxDb ourselves. Following the instructions in ensembldb’s vignette file, we can build the TxDb object from the Ensembl latest release, which is release 84 (Mar, 2016) at the time of writing. Ensembl releases all human transcript records as GTF file, which can be found here ftp://ftp.ensembl.org/pub/release-84/gtf/homo_sapiens/Homo_sapiens.GRCh38.84.gtf.gz. So filtering is done by passing special filter functions to filter=. Likewise, there are TxidFilter, TxbiotypeFilter, and GRangesFilter for filtering on the respective columns. Check the result with the online Ensembl genome browser. Note that Ensembl release 84 use hg38. We can load the sequence from BSgenome.Hsapiens.UCSC.hg38, however, we can obtain the genome (chromosome) sequence of Ensembl using AnnotationHub. 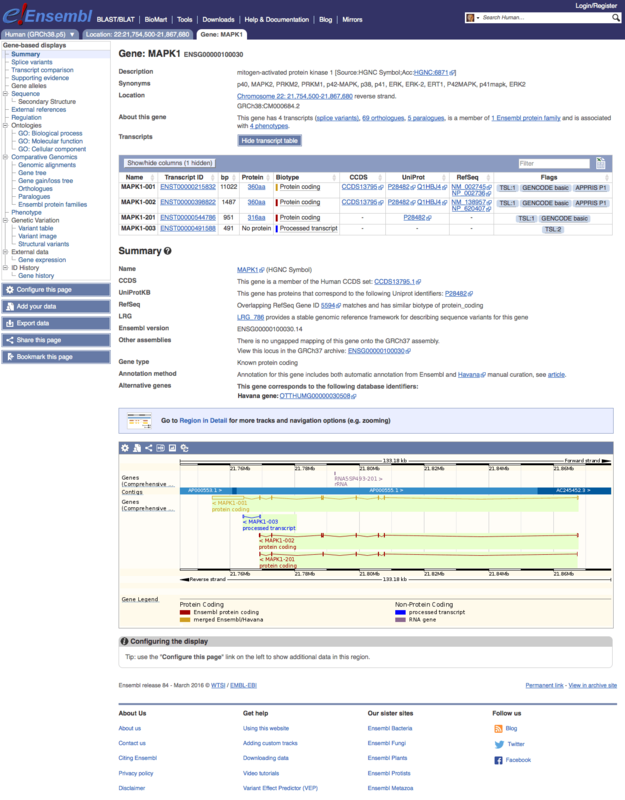 References of non-model organisms can be found on AnnotationHub, many of which are extracted from Ensembl. But they can be downloaded as Bioconductor objects directly so it should be easier to use. First we create a AnnotationHub instance, it cached the metadata all available annotations locally for us to query. From the search results, human hg38 genome sequences are available as TwoBit format. But having multiple results is confusing at first. After checking the Ensembl’s gnome DNA assembly readme, what we should use here is the full DNA assembly without any masking (or you can decide it based on your application). Then we can use it to obtain the DNA sequence of desired genomic range (in GRagnes). BioMart are a collections of database that can be accessed by the same API, including Ensembl, Uniprot and HapMap. biomaRt provides an R interface to these database resources. We will use BioMart for ID conversion between Ensembl and RefSeq. Its vignette contains solutions to common scenarios so should be a good starting point to get familiar with it. Here we will use Ensembl’s biomart. Each mart contains multiple datasets, usually separated by different organisms. In our case, human’s dataset is hsapiens_gene_ensembl. For other organisms, you can find their dataset by listDatasets(ensembl). The way to query the ensembl Mart object is slightly different to how we query a AnnotationDb object. The major difference is the terminology. Luckily, Mart object provides a compatibility layer so we can still call functions such as select(db, ...), keytypes(db), keys(db) and columns(db), which we frequently do1 when using NCBI/UCSC references. We start by finding the MAPK1’s RefSeq transcript IDs and their corresponding Ensembl transcript IDs, which is something we cannot do by our locally built Ensembl TxDb nor the human OrgDb. So some of the MAPK1 Ensembl transcripts does not have RefSeq identifiers. This is common to see since RefSeq is more conservative about including new transcripts. Anyway, we can now translate our analysis result between a wider range of naming systems. each of the command return a data.frame that contains each filter’s or attribute’s name and description. Frankly I don’t have experience for such conversion in real study (the converted result still gives the sense of unease), but anyway here I follow the guide on PH525x series. In Bioconductor, we can use UCSC’s Chain file to apply the liftOver() method provided by package rtracklayer. To convert regions from hg38 to hg19, we need the hg38ToHg19.over.chain file, which can be found at ftp://hgdownload.cse.ucsc.edu/goldenPath/hg38/liftOver/. Then we convert MAPK1_hg38 to use the hg19 coordinate system. So the conversion worked as expected, though it created a gap in the range (missing a base at 22216653). I haven’t looked into the results. To ensure the correctness of the conversion, maybe a comparison with CrossMap is needed. We skimmed through OrgDb and TxDb again using the Ensembl references, including how to build the TxDb for Ensembl locally and obtain external annotations from AnnotationHub. BioMart is an abundant resource to query across various types of databases and references, which can be used in conversion between different naming systems. Finally, we know how to convert between different version of the reference. Though the correctness of the conversion requires further examination (not meaning it is wrong), at least the conversion by liftOver works as expected. Starting here, you should have no trouble dealing with annotations in R anymore. For the next post, I plan to further explore the way to read sequencing analysis results in R.